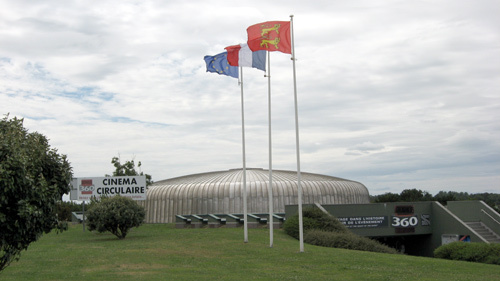 Cinema Circulaire 360 is located in Arromanches on the Normandy coast of France. 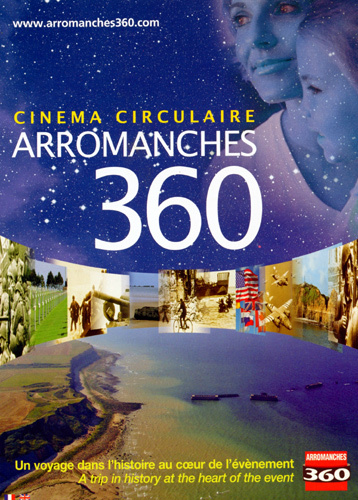 The "Arromanches 360" circular cinema was created upon the initiative of Lower Normandy Regional Council for the Fiftieth Anniversary of the Landing in 1994. The cinema presents an exceptional film projected on 9 screens in a circular cinema: "Le prix de la liberté" / "The Price of Freedom" / "Der Preis für die Freiheit". The film is shown at Arromanches 360 exclusively. 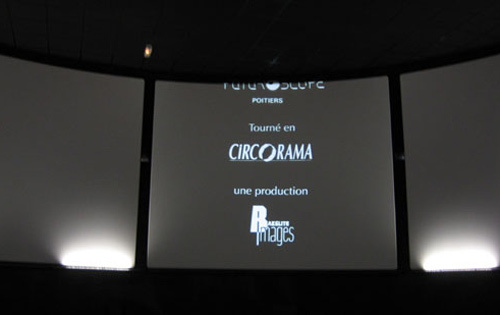 The Circorama photographic and projection system was conceived exclusively by Patrick Besenval and the Futuroscope productions. 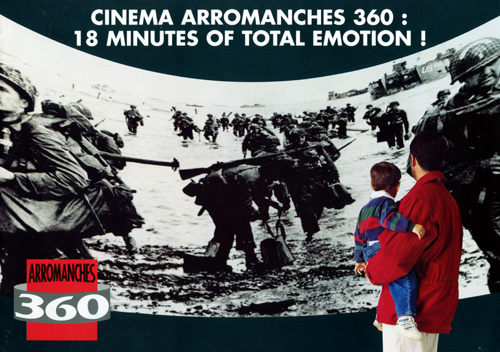 Arromanches 360 is the only cinema of its kind in France. The Cinema Circulaire 360 is located on top of the cliffs in the small Normandy town of Arromanches, a small costal village right on the beach in Normandy. The town is famous for being the home of one of the Mulberry harbours created for the invasion in 1944, also known as D-day. Cinema Circulaire 360 was built in Arromanches specifically because of the view and panorama of the remains of the habour, which is still visible at sea (you can see them on Google maps). The Phoenix block ships were left after the war and are still there, deteriorating from being in the salt water for 70 years (they were built to last for 6 months). Twice a day the tides come in and "drowns" the concrete. "The Price of Freedom" is shown every day on Cinema Circulaire's 9-screen system. There is a museum by the harbour which explains the artificial harbour, and most of the shops are selling WW2 memorabilia, including DVDs of "The Longest Day" and "Saving Private Ryan". 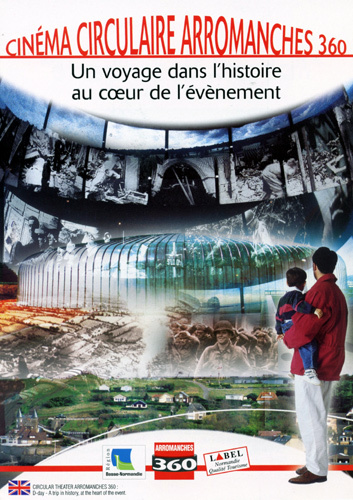 The Cinema Circulaire 360 is the 3rd most popular attraction in Normandy after the Tapestries in Caen and Mount St. Michel. Cinema Circulaire 360 has 250.000 guests every year and is partly dug into the cliff, with only the top "hat" visible from the road. The roof is made of steel, and in some cases - when the sun is in a particular location - drivers can be blinded from the reflections. 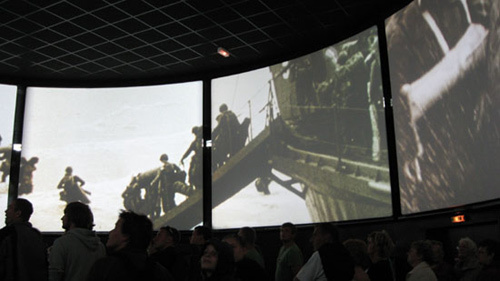 The purpose of The Cinema Circulaire 360 was to keep the memory of the allied invasion alive. The memory of WW2 is BIG business in Normandy and every shop sells some sort of memorabilia. Every little town have at least one tank placed on the square in the middle of the town, reminding people of the war. You can easily get the feeling that D-day was the best thing that happened in Normandy. For 70 years Normandy seems to be doing good business on this dark chapter in Europe's history. Normandy is a beautiful and a popular place to go to. There are many foreign visitors everywhere, including our self's from Denmark. National flags from allied forces are everywhere in the countryside. 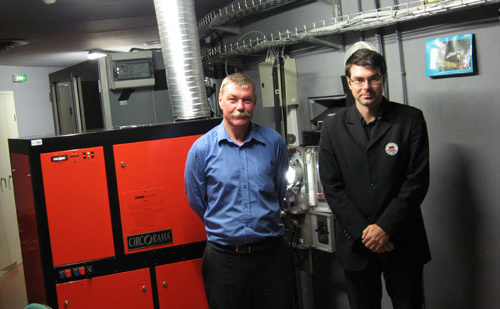 Cinema Circulaire's projectionist Gilles Launay (left) and manager Johan Lesauvage (right). When I visited Cinema Circulaire 360 during the summer of 2008, they were still showing 35mm films from nine "Simplex 35" projectors on nine screens. 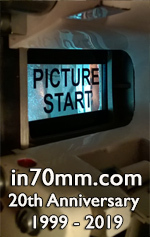 Today everything has been changed in favour of digital projection. Francois Herr of Cinematerial in Paris installed all projectors and screens etc when Cinema Circulaire 360 opened in opened 1994. The 9-panel prints was made by Gulliver Arane Laboratory in Paris. When I visted the cinema in 2008 I was shown around by Mr. Johan Lesauvage and his crew. It was a very special experience to watch a circular film. There are not many cinemas like it in Europe. I once saw a similar cinema in Disneyland Paris, and also in Poitiers in 1992, but they are closed today I understand. But Arromanches still open, and has even premiered a new film 6. June 2014, called "Normandy's 100 days". 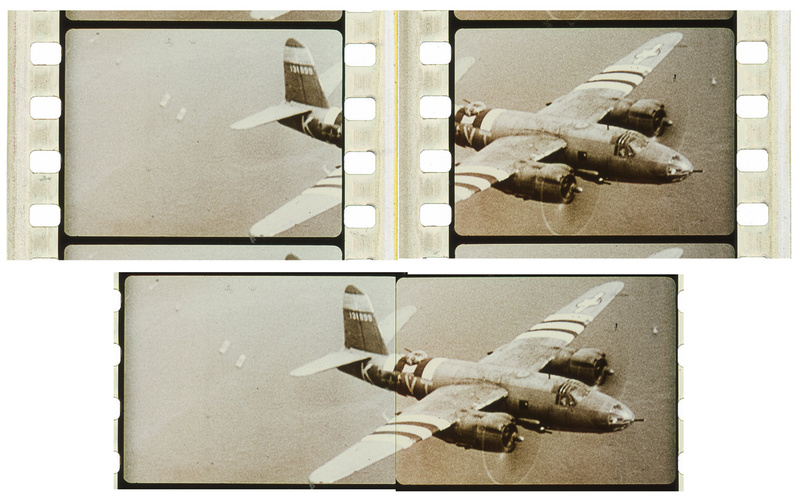 One 35mm panel of "The Price of Freedom". 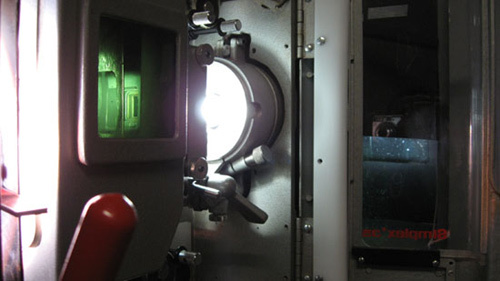 The complete film is stored and projected from a closed cabinet. From the entrance where you buy your ticket, you are let into the foyer with large displays about the Mulberry Harbour, the film, and WW2. At some point you are let into the circular cinema with nine screens above your head. There is no seating area, it's only standing room for the 250 spectators. The audience gathers gathers around barriers which they can hold on to, to avoid falling when the film starts. When you see the film, your head is turning in all directions, and I assume that can cause some disorientation. Once the film is over, you exit the cinema on the opposite side and directly into the souvenir shop (how convenient) with a spectacular panoramic view of Arromanches and the sea. The souvenir shop sells books, video, models, post cards, flags etc. Click the image, to see enlargement. "The Price of Freedom" contains fresh 360 degree footage photographed in Normandy including - I seem to remember - some scenes from Port en Bessin-Huppain, which is also featured in "The Longest Day", by Ken Annakin. The majority of the scenes, however, are original vintage WW2 black and white photography, which has been restored and split up into 2-panel and 3-panel sections. The contemporary scenes are mixed with the black and white material to show the audience then and now scenes. The modern scenes are filmed in 360 degrees, and shows some of the important locations of the invasion, including Point du Hock and the cemetery in Colville. The black and white material looked quite impressive and is very emotional to watch. I don't recall seeing a complete 9-panel black and white scene. "The Price of Freedom" was directed by Dominique Benicheti and runs 18 minutes. It was shown twice an hour, starting 10 min past and 20 minutes before the next hour. The cinema opens around 10 in the morning, and plays the film until around 19 in the evening. "The Price of Freedom" being projected from a Simplex 35 machine. One of nine. 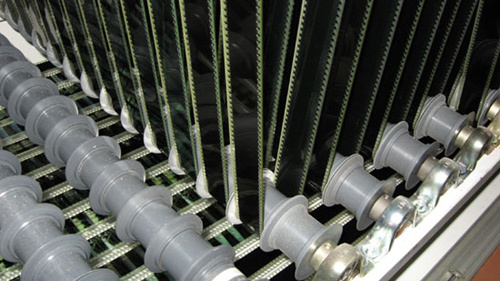 The cinema have 9 screens which are divided by a narrow slit which allows the projectors to project across the room onto the screen on the opposite side of the cinema. I don't recall it being a distraction seeing the light beams, on the contrary, I was excited to experience this marvel of projection technique. I regret having seen the film only once while I was there, but I was trying to absorb the technique, rather than the film. "The Price of Freedom" end titles with "CircOrama" logo on one of the nine screens. Upstairs in the the projection room there were nine Simplex 35 machines, and behind every machine a large endless-loop cabinet for the film. The film on 9 projectors ran completely automated, with a supervisor, overseeing the system. The sound was played digitally in synch with the full frame 35mm. Visiting Normandy is very nice, the people are great, the country side is fantastic, and the scenery spectacular and it's not difficult to reach. Access to Arromanches is mainly by car from nearby Caen or Bayeux or directly from Paris by road and train. You can take the train from Gare St. Lazare in Paris to Caen or Bayeux. The journey takes about 2½ hour. We spent a week in Normandy seeing all the sights, including Pointe du Hoc, the cemetery in Colville, and many of the locations featured in "The Longest Day". I recommend going to Normandy, feel the touch of history and pay your respect to the heroes who died on the beaches in 1944. Thanks to Johan Lesauvage, Gilles Launay and the staff for showing us around in July 2008.